Imperfect Love is a “serious romantic comedy” loosely based on the life and work of the 19th-century Italian actress Eleonora Duse and her nine-year love affair and tumultuous working relationship with the poet and playwright Gabriele D’Annunzio. Set in Rome on the stage of the Teatro Argentina in Rome in 1899, the plot of Brandon Cole’s two-act period play follows the backstage dramas of a theater company struggling to produce a new work. The late 19th century marked a turning point in theatrical history, when the melodramatic works of playwrights such as D’Annunzio were beginning to be overshadowed by the more cerebral work of the likes of August Strindberg and Henrik Ibsen. In Cole’s plot, this change drives the story, creating conflict not only between the lovers but also among the members of the theater company. When Act I begins, the morning after a disastrous opening night, playwright Gabriele Torrisi (played with subtle charm by Rodrigo Lopresti) and actress/manager Eleonora Della Rosa (passionately played by Cristina Spina) lock horns in a battle of wits, spewing professional insults and personal threats, displaying the universal complexities of mixing business with pleasure. At the crux of the matter is the way Torrisi’s play ends, the “tortured climax in Act Two.” Della Rosa insists she needs extra lines; Torrisi remains firm that extra lines will disrupt the pacing. Their argument feeds Torrisi’s muse—a clever and insightful touch, reflecting the life as art/art as life loop that embodies the creative mind and which has the potential to destroy relationships. Rodrigo Lopresti (left) is Gabriele Torrisi and Cristina Spina is his muse, Eleonora Della Rosa, in Brandon Cole’s Imperfect Love, based on the lives of Gabriele D’Annunzio and Eleonora Duse. Top: Ed Malone (left) is the clown Marco, and David O’Hara is his cohort Beppo. Della Rosa: Then maybe you lost your touch. Della Rosa: Maybe your playwriting days are over. Torrisi: What if they are? Della Rosa: I’ll be dragged down with you. Torrisi: You fool. Why not? Della Rosa: You ask why? Because I love you. Torrisi: We found the last lines, finally. 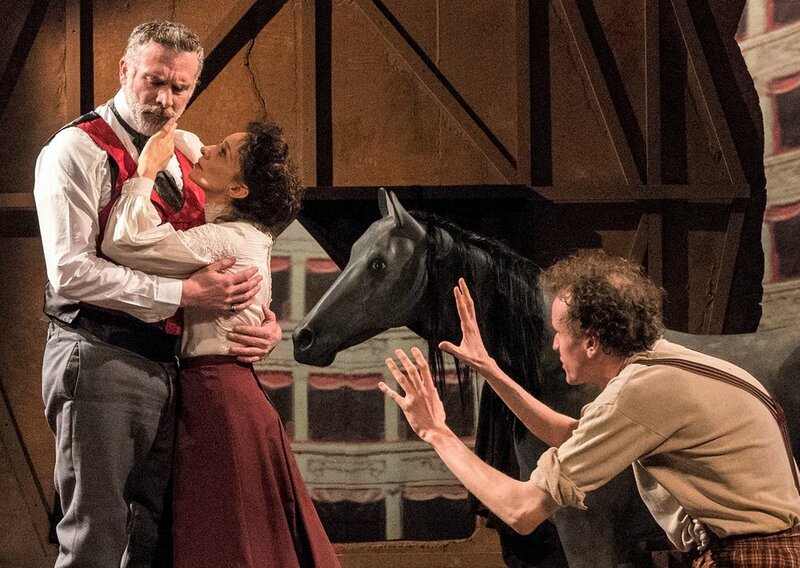 Meanwhile, the lovers must contend with the clowns, the elastic-limbed Marco (Ed Malone) and apple-munching Beppo (David O’Hara), who bring levity and animation to the stage in classic form, at times assuaging the tension, at others stoking the dramatic fires. They also introduce two other characters, Pallone and Asters, the theater owners who remain offstage, and who, the clowns announce, are threatening to close the play. Marco and Beppo express their fierce loyalty to both Torrisi and Della Rosa, and they also make asides about needing to continue working. For both reasons they undertake to do whatever they can to resolve the problem. Enter Domenica (Aidan Redmond), the gallant male lead in Torrisi’s play, to pour salt on the wounds: “Are there new lines for Act One?” As the story progresses, the clowns and Domenica tear Torrisi’s play to shreds in pursuit of a laugh and of a new, improved ending for Act I.
Spina and Malone with Aidan Redmond (left) as Domenica, the male lead of Torrisi’s play. Photographs by Richard Termine. Interestingly, this protracted struggle, focusing the action almost entirely on the matter of finding a better way to end the play, slows the play down in a good way. It allows for the audience’s total immersion into the time and place, the emotions, intentions and motivations. This microcosmic attention to detail in the characters’ worlds crosses over to director Michael Di Jiacomo’s production. Slow and steady is visibly, audibly and viscerally apparent in the creative interpretation, with credit to Gianni Quaranta’s bold sets and rich costumes. Kudos to the attention to period detail offstage as well. The theater itself is dressed with period appropriateness—red velvet curtains and a gilt-edged proscenium arch evoke a sense of being back in time. A model of the set is perched on a pedestal front of house, also reflecting period practice, contributing to the immersive experience. This slow-burn approach to theater may be scorned by 21st-century minds, although many are beginning to realize that slowing down can offer more control; the ability to reflect more carefully; access new insights; and produce more original ideas. The production works on many levels. Part of its beauty is how closely linked the subject matter of the play is to the process of its own creation, in which Cole invested 30 years of his time to write. Cole recounts that in 1984, 18 lines of dialogue came to him, and that these are the same opening lines that are in this much-revised version of the play that exists today. Cole’s dedication, belief and patience have paid off. Imperfect Love is a labor of creative love. The world premiere production of Imperfect Love runs through Feb. 25 at the Connelly Theater (220 E 4th St., between Avenues A and B). Evening performances are at 8 p.m. Tuesday through Saturday; matinees are at 3 p.m. on Sunday. For tickets and information call (800) 838-3006 or visit imperfectlove.net.